Armenia is known as the motherland of viticulture and winemaking. The legend tells that Noah planted the first vineyard in the plateau of Ararat. Burning sun, rich land and the hard work of the peasant have given Armenian wine its unique taste and odour. 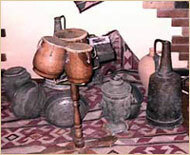 Ancient wine vessels, sometimes with condensed antic wine, are found in many historical places. The programs, which include wine testing, are very popular. The tourists who pass through Vayots Dzor region always taste the different bouquet of wines in small wineries. Wine is the part of the national lifestyle, and traditional dishes are not complete without wine, drunk to beautiful and traditional toasts of Tamada (Toastmaker). This region is famous for its red wine, especially "Areni". This wine is made of the relict vineyards the history of which goes to1000BC. They are really unique, and tasting once you will test them again and again. Armenia's enterprises produce over a dozen brands of brandies which according to the unanimous opinion of expert tasters are in no way inferior to the world-famous French ones. Many of their labels show the gold medals awarded at international exhibitions. The history of Armenian brandy starts from the vineyards of the Shustovs from the beginning of XIX century. According to a legend, after adopting Christianity as a state religion, the relics of the saints were transported to Armenia and in the places where the ceremony stopped, the springs of mineral water burst out. Dozens and dozens of unique fresh-water and mineral springs of various physic-chemical compositions are found in different parts of this sacred land. Stone baths, dating from the1st century, were discovered almost in all regions of Armenia. Lavash - the national thin, paper like bread of Armenians. It is baked in tonyr and they are so transparent that the sunrays pass through them. Armenians use it also as a plate, a saucepan, a spoon. Many dishes are cooked on mild fire, covered with lavash. Traditionally Armenians eat their food folded in lavash. Armenians are fond of their fruit and vegetables and widely use with in the national cuisine. Some Armenian varieties of apricots, peaches, pomegranates, walnuts and quince are superior to the world's best grades. As early as the 4th century BC Alexander the Great brought apricot trees from Armenia to Greece whence they found their way to Rome. Lavash - the national thin, paper like bread of Armenians. It is baked in tonyr and they are so transparent that the sunrays pass through them. Armenians use it also as a plate, a saucepan, and a spoon. Many dishes are cooked on mild fire, covered with lavash. Traditionally Armenians eat their food folded in lavash.